A day off. Walk in the Park. Visit Friends. Followed by a session for WNYC, the show Spinning on Air with David Garland. I enjoyed this one most. The next day I would puncture the delightful camaraderie of the Doveman ‘Burgundy Stain Sessions’, Here is I and the other delights of the night (Sara from Tegan and Sara, Dawn Landes, Chocolate Genius, Elysian Fields, Martha Wainwright). Jonathan and Thor pick me up from the Airport (as you know I can’t afford a Taxi) and take me to my friend Sam’s house where I’ll be based. The first showcase was playing the Austin Convention Center corridor. Outside the ‘Flatstock’ poster exhibition, inside which were exhibiting the UK Poster Association co-spearheaded by my friend Luke Drozd. The show was attended by Luke, Eva, two of their friends, a Mexican Girl, one boy with a Guitar and his girl-friend and a Buddhist. I gained three incense sticks and nutty bar. Oh and the Mexican Girl did a radio interview so there was something on radio in Central America. Oh, check out the local paper: Mojo recommends in the Austin Chronicle. After lunch with Jonathan, later that day I want to see Samamamidon at the French Legation and all that, but had to leave early to give Alex Highton my guitar. Shame. So on the day went and I played the Local showcase, following JTP. It worked. I broke a glass. I spilled some red wine on a lady. I got the crowd to do a chorus. It worked….kind of. The next day was the SXSW Yorkshire showcase, following on from and all-neck-breaking all-puking Pulled Apart by Horses, was no mean task. It worked, with apologies to the sound man for not explaining what might happen. Me and Sam ate some savoury crepes which did the job. Then Made our way to the Charm School Vintage clothing store and wig place where Dana Falconberry had arrange that a load of people play. Despite Red Hunter accusing me of taking drugs I play a show with the help of Jordan Geiger and Kevin Schneider. All good, She Keeps Bees bring on the SuperMoon. I have a day off before going to the city of Los Angels. Big thanks have to go to Hunter and Ariela for letting me stay, Hektor Fontanez for providing the connection. So you should all check out Imaginary Weapons and Universe. The show was on the second day: THIS is what was said. I sailed home on the clouds in a big metal bird shaped sky boat and am relaxing. WOW! 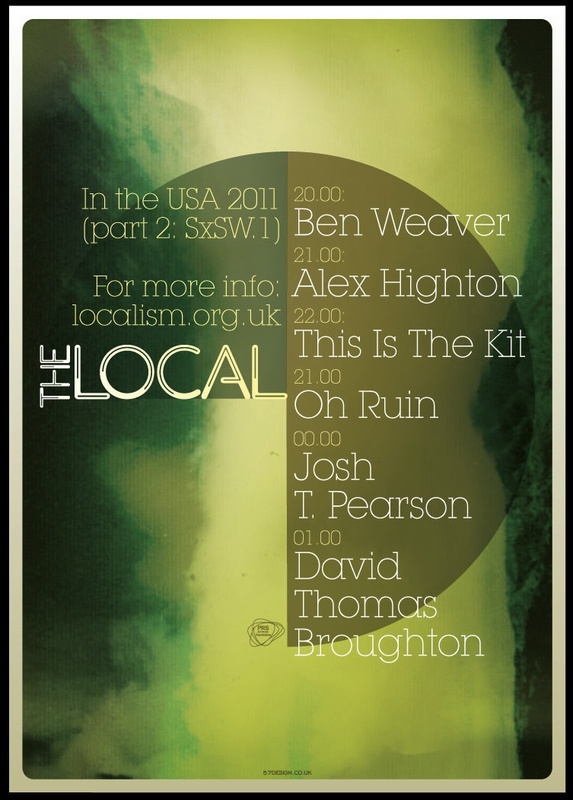 Look at this, this looks like a great show, shame you’re not going to South By Southwest!